The very best in historical reproductions. Impedimenta offers you the most accurate reproductions available today. 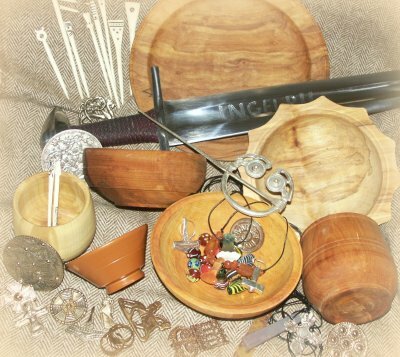 Over twenty years of research coupled with the artistry of craftspeople who are authorities on their subject enable us to bring you the best in ancient and medieval reproductions. Most of our stock is not made in quantity and we may only have one or two of each item available at a time. We are happy to take bespoke orders, and in many cases can do the research for you so you can have the most appropriate solutions for your needs. Don't expect a proper catalog for a while. The exchange rates are slowly improving, but until they get a bit better it is just too expensive. But I and my colleagues are still available for bespoke (custom) work and consulting. Details and contact information will be forthcoming. If you are one of the two or three people who periodically check in, my apologies that email is down right now. Actually it has been down for a while, I recently discovered the reason I never had received any email at the former temporary address was that the account was not set up correctly. Unless otherwise specified, text and pictures copyright © 2008 Impedimenta.